This is a fantastic blog post summarising several articles relating to imaging and the presence of pain. Medical imaging such as MRI, Ultrasound, X-rays and CT scans are commonly used to help identify pathologies in joints and structures such as the shoulders, hips, knees and spine. But did you know that most of the findings on these images are NORMAL??? Joint and muscle degeneration is a normal part of the ageing process, and a high percentage of the time are NOT the causes of pain. Let’s use the spine as an example. One study (Brinjiki et.al., 2014, American Journal of Neuroradiology) used data from over 3000 Lumbar spine MRIs of healthy people. 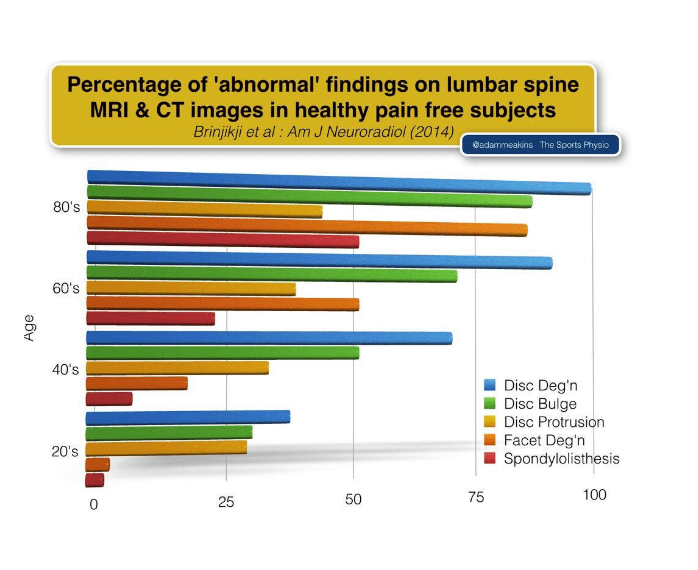 Of these 3000 scans, a high prevalence showed evidence of lumbar spine “pathology”, such as disc degeneration, facet joint degeneration etc (see image). Don’t let a scan define you! Despite all the scary stuff that is written on radiology reports, this only gives one piece of the puzzle when diagnosing injury or pathology. 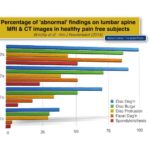 Your imaging results may not be the cause of your pain! Degeneration is a normal part of the ageing process! Strength-based resistance training is important as we age to help slow these degenerative effects. The saying “a picture is worth a thousand words” is often used to explain how a complex situation, idea, or thought can be conveyed with a single picture.